An aunt passed away Sunday night. I was able to be with her yesterday afternoon although I did not think then that it would be the last time I that I will hold her hand and see her breathing. Please join me in prayer as I offer the Lord's Psalm for her. Thank you. Photo was taken last March 2012 during our trip to Apo Island. Then this evening (Monday), daughter and I rode a cab to Greenhills. The name of the cab that we hailed was- Vaya Con Dios. 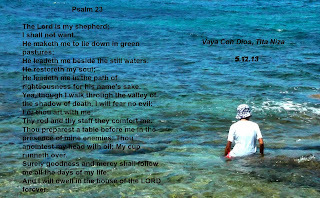 I added the Psalm 23 prayer on the photo (above) as soon as we arrive home last Sunday night. I believe she heard me say the prayer for her when I visited her last Sunday, and heard me say it again when I was typing the prayer on the photo. A way of expressing her thanks and letting me know that she is with God now.